Are you in the search of a top best subwoofer to have the ultimate audio experience? Here is our list of the best subwoofers under 200 dollars if you are looking for something affordable yet snazzy which can enhance the audio experience at your home or office. If you were to look up the best inexpensive subwoofers, you will find that there are a lot of them in the market. But the problem lies in how many of those speakers are really worthy of the price you would be paying for them. 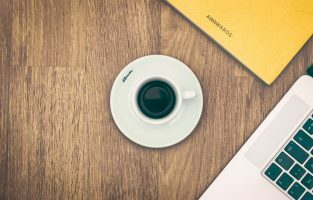 With a little insight into the best speakers available for you, you can easily find which one will be most suitable for you. Subwoofers have become increasingly popular both at home and outside because of their ability to render unsurpassed sound / audio quality. They reproduce low frequencies with utmost clarity and feature a woofer or more in fitted inside a loudspeaker enclosure. A subwoofer may be either active or passive. An active subwoofer features an inbuilt amplifier, whereas the passive counterpart uses a subwoofer driver and enclosure with an external amplifier. The good news is that whichever type you opt for, you can most often get a good subwoofer for a decent price and with impressive features. However, you must always remember a couple of things when you decide to invest in a subwoofer. Firstly, take care to see that the subwoofer you are planning to buy is from a manufacturer that can be trusted. Secondly, make sure that you follow the setup instructions properly. This is because a poorly designed subwoofer tends to degrade the musical performance of a playback system over a period. Here, we bring you a list of subwoofers under the $200 price tag that you may consider checking out. The single 10-inch subwoofer features an all-MDF non-resonant enclosure construction designed for low distortion-free frequencies. The black subwoofer has a 10-inch dynamic-balance cone driver made of polymer composite and a high-current amplifier that renders big bass. The amplifier has a 100 W dynamic power rating and a 50 W continuous power rating. The unit also implements laser based Klippel measurement technology for enhanced linearity, as well as precise and deep sound. The enclosure comprises internal bracing and 0.75-inch thick baffles and depicts a grainy finish on the sides. 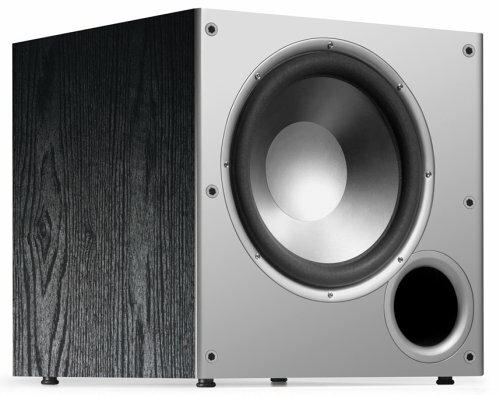 The unique design ensures that the subwoofer is steady and stable even at high volume levels to ensure that the power is utilized efficiently. It comes with two audio speaker inputs and outputs and a downward firing floor coupled port. The smart sensing circuitry turns off and on automatically to prevent damage to the subwoofer whereas the compression circuitry reduces distortion to the maximum extent at high volume. However, for best performance of the subwoofer, you must not use it at volumes greater than 85 dB continuously for a long period. The Polk subwoofer is a great choice for those who want to enhance their movie watching experience, with high audio quality. The high-grade speaker inputs and outputs make the subwoofer ideal for those who want to connect it easily to any system. 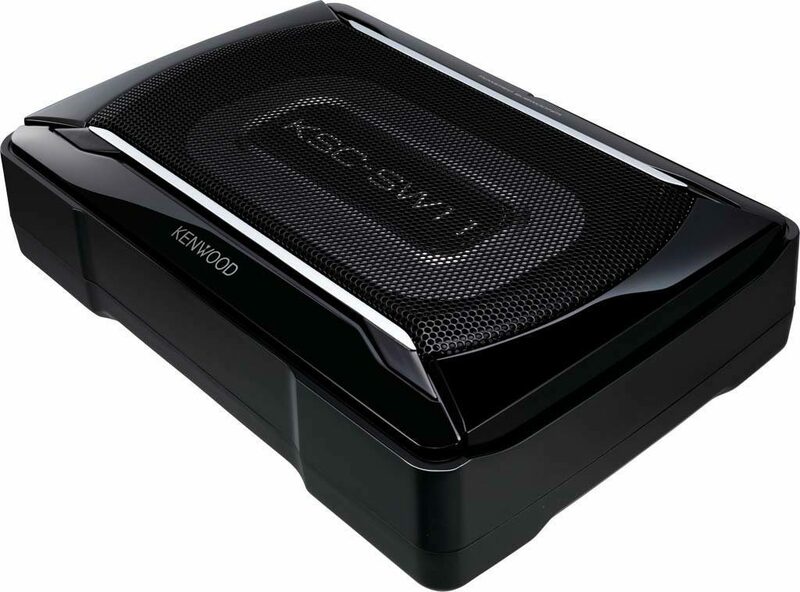 The Kenwood subwoofer comes in a sturdy aluminum enclosure. The black compact unit features a wired remote to maintain a control over variable low-pass crossover and volume levels, as well as ground wire and power harness. It also includes a built-in amplifier with an RMS power rating of 75W and a maximum power rating of 150W, thereby eliminating the need for an external amplifier. 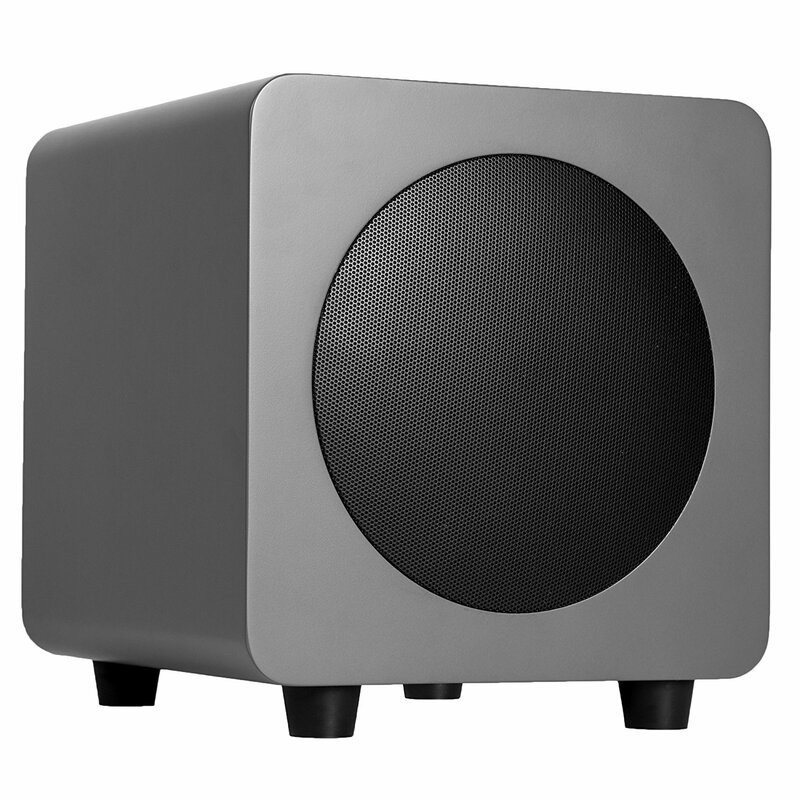 The subwoofer has a rectangular design and sports a classy look. You can connect it to your battery by just wiring the subwoofer to it and grounding it. 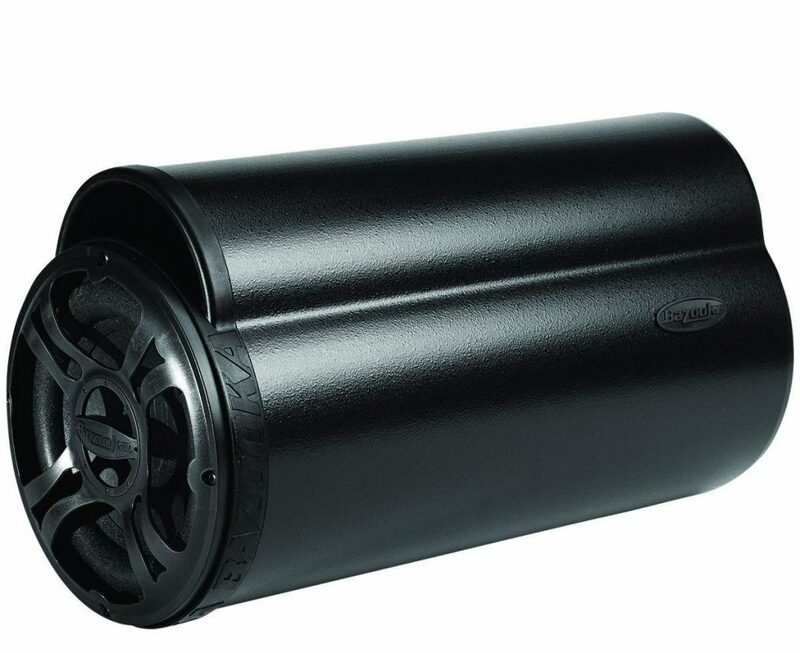 This subwoofer from Kenstar meets the requirements for those who want to use a unit with high power in small spaces, such as under the car seat. The device is suitable for those who want a subwoofer that they can install easily without any hassle. The subwoofer has a 2-inch dual aluminum voice coil, a polypropylene cone, a foam surround and a customizable trim ring. The unit features 88 dB sensitivity (1 watt / 1 meter), 32 Hz resonant frequency, 34 Hz port frequency, 4 Ohms impedance and 1,800 W power rating. It comprises a pole vent and works in a ported or sealed enclosure that is made of 3/4″ MDF. The black colored device has a measurement of 13 x 13 x 6”, a mounting height of 5.38”, a mounting hole diameter of 11” and a round port circumference of 3”. 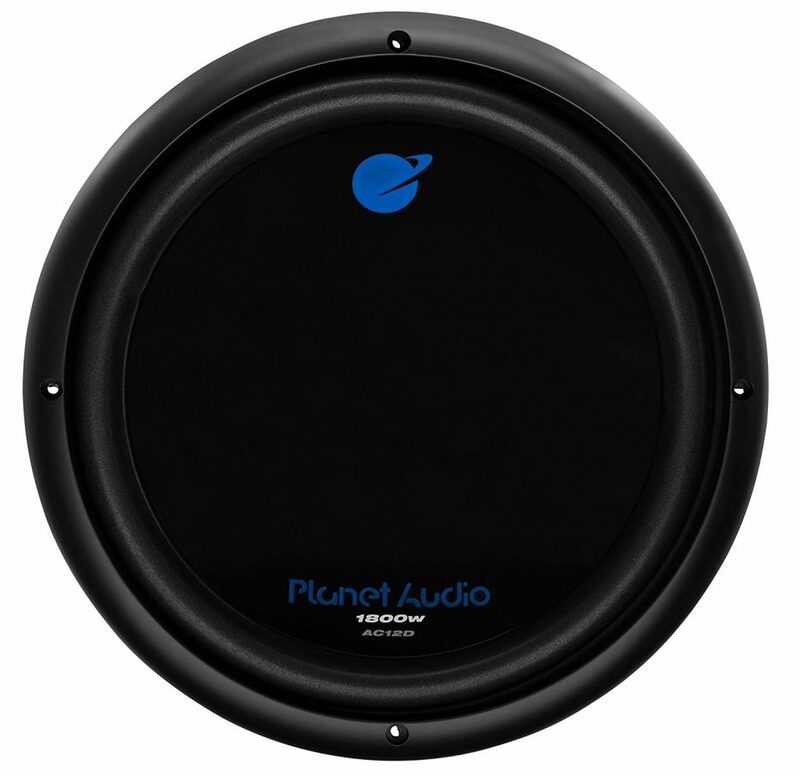 The Planet Audio subwoofer is the best bet for people who are looking for a durable unit, because of the polypropylene material to make the cone and aluminum’s corrosion resistance property and low density. 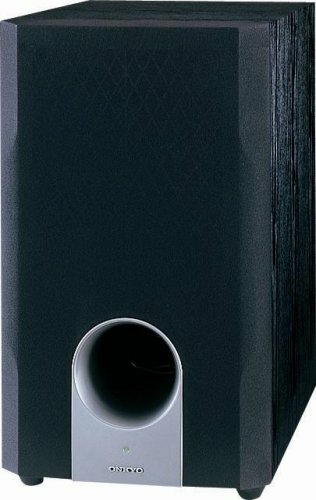 The 1800W power rating ensures that the unit is ideal for those who want to enjoy loud sound. The 8-inch Acoustic Audio unit is a long throw down-firing subwoofer with a frequency response of 26 to 250 Hz, 30W peak power, 97 dB efficiency and 8 ohms impedance. 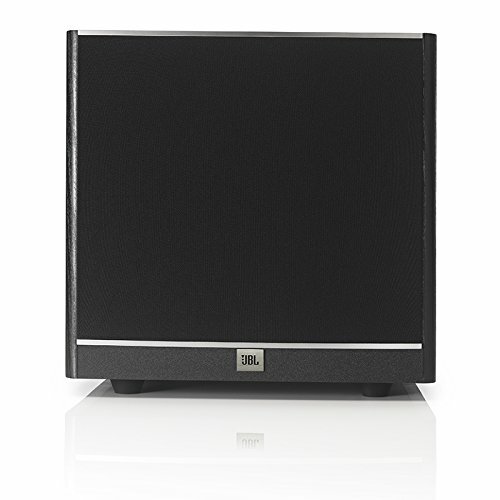 The unit comes in a high-density MDF enclosure with black ash finish and features advanced RFL bass reflex design. The subwoofer has an adjustable independent gain control and a PVA treated cone of high rigidity. It also includes speaker level and low-level inputs and outputs, a bass port slotted at the bottom, a phase control switch, signal sensing auto shut off function and variable low pass frequency crossover control. The inbuilt amplifier has high efficiency to render crisp and clear bass sounds while the long excursion cone delivers an accurate and deep response. In addition, the enclosure construction style, speaker geometry and the right choice of driver materials assure you of clearer and cleaner lower sounds. The damped and internally braced enclosure cuts off internal standing waves and other resonances that affect the performance. The driver is made of resonance-free, dynamic balance and durable materials. 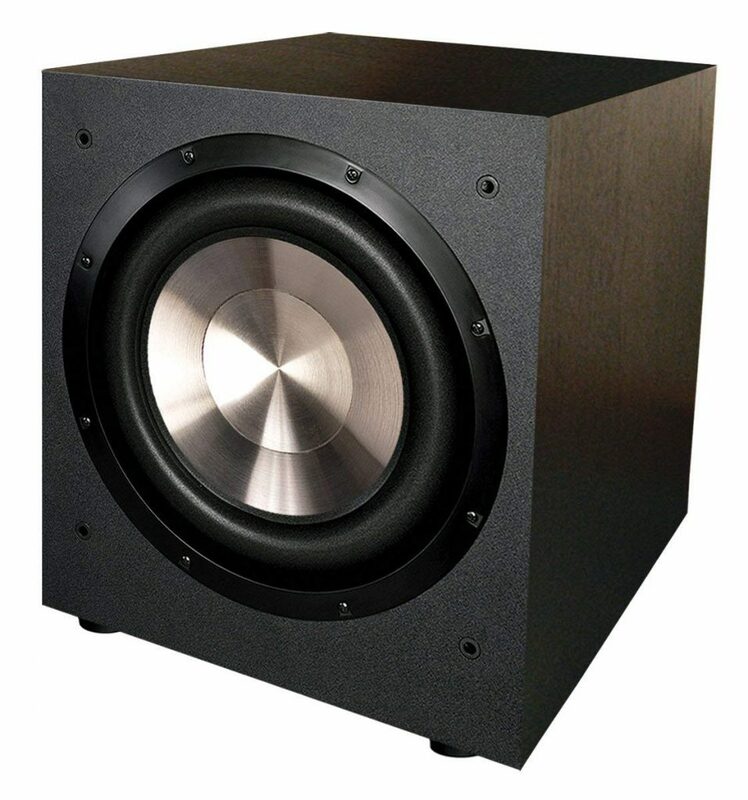 The subwoofer is the best bet for people who would like to connect it to their home theater or surround systems to amplify the sound produced. The unit is a great idea for those who want to save on floor space by mounting their subwoofer on either the ceiling or the wall. 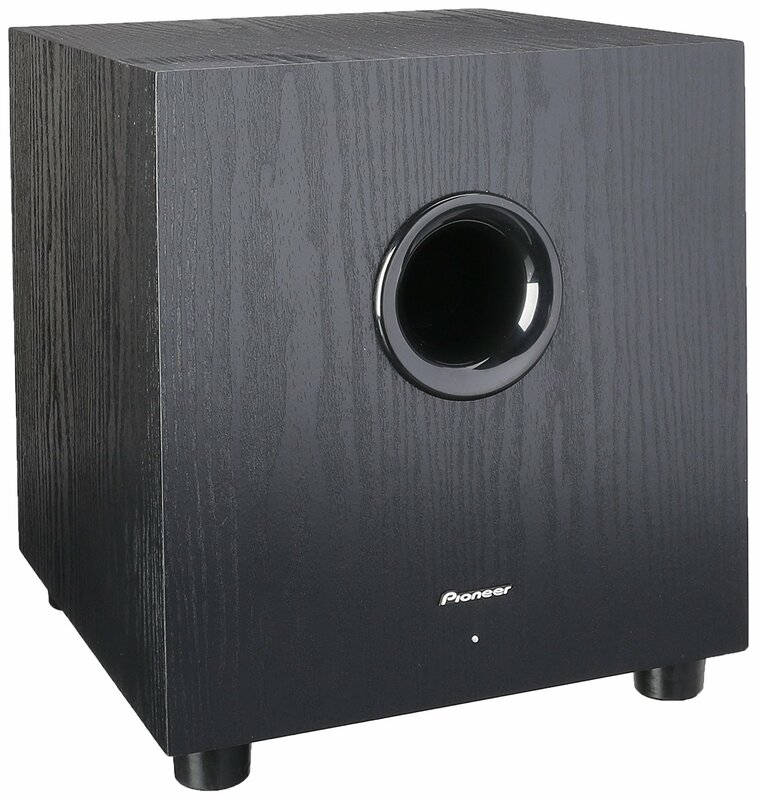 The Pioneer subwoofer features a sealed enclosure with carpet finish. 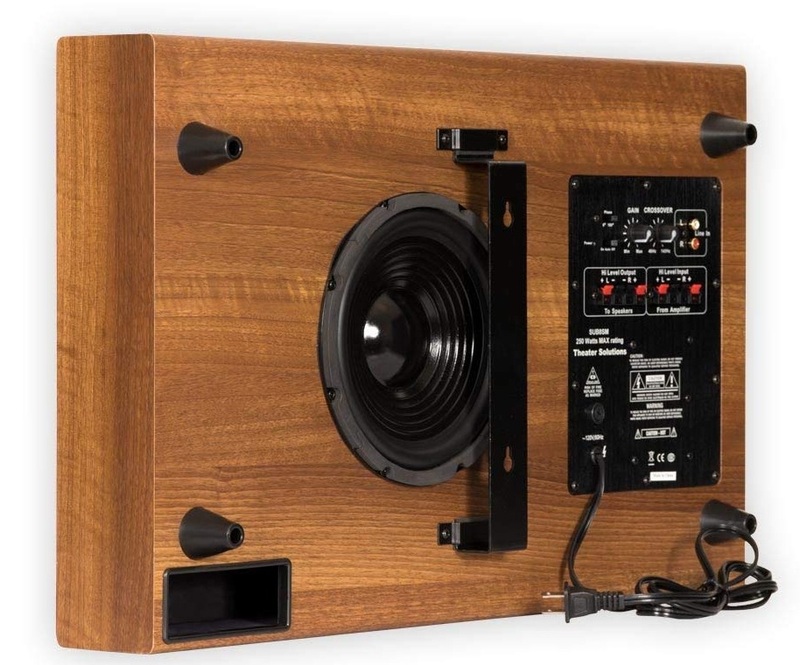 The 12” unit comes preloaded with a Class D amplifier, a urethane surround, a cellulose fiber cone and a remote knob. The black accessory is available in a size of 26 x 18 x 12 inches. The subwoofer has a peak power rating of 1300W; an RMS power rating of 350W; the sensitivity of 114 dB and a frequency response of 20 to 125 Hz. The amplifier has a bass boost of 0 to 12 dB and crossovers. The subwoofer is worth considering by those who want their subwoofer to sport a distinct look because of its carpet finish. The device is a great idea if you want your system to produce loud sounds. The subwoofer has two 8-inch woofers made of injected polypropylene, big magnets and a reinforced back bridge plate to produce good quality bass. The passive amplifier also includes a paintable grille, a cutout template that also acts as a paint shield and a dog-ear bracket system to mount the subwoofer. The black unit has a power rating of 350 W, a frequency response of 38 to 500 Hz, the sensitivity of 90 dB and an impedance of 8 ohms. You must connect a subwoofer amplifier to power this device. 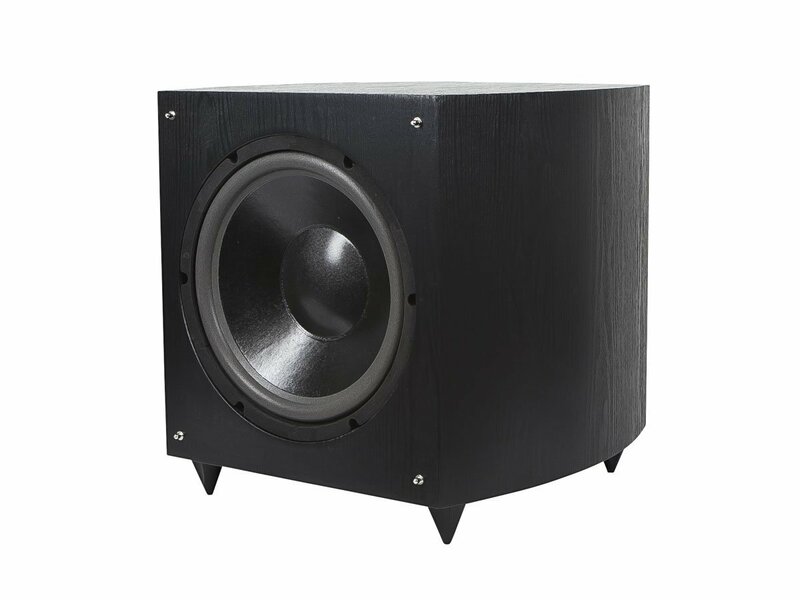 The OSD Audio subwoofer has a size of 11-7/16 x 18-7/8 x 4 inches and a mounting depth of 3-9/16 inches. 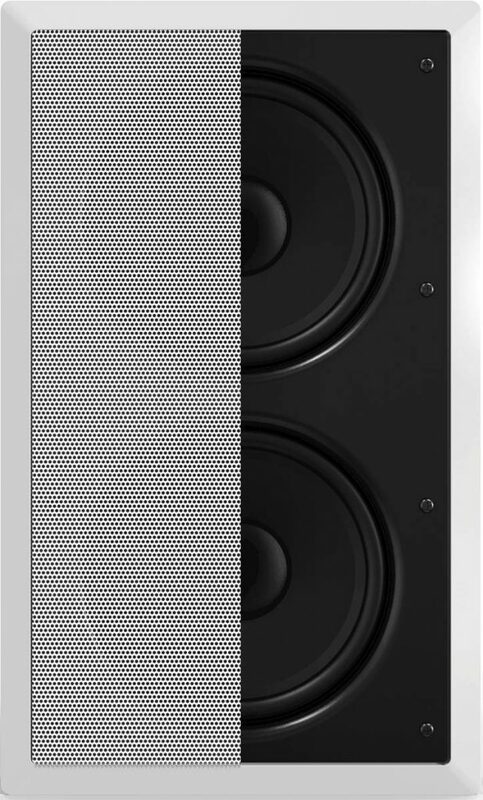 The unit is a great choice for people looking for a wall-mount type of subwoofer because of limited floor space. The subwoofer is worth considering if you are determined to experience more bass with your home theater surround system or when listening to your favorite music. This subwoofer features an 8-inch powered tube with a 50 W power rating. The tube has a matte finish to give it a distinct classy appearance. There is no need to drill holes to install the Bazooka unit. It allows the use of a remote bass control module if needed. The subwoofer comes along with a universal BTAH and FAST-9999 extension cable. It has a size of 20 x 6 x 19 inches. The subwoofer is ideal for pop and rock music lovers who enjoy the loud sound. The unit is worth considering by people for whom rich bass sound rendition from their home theater is of utmost importance. 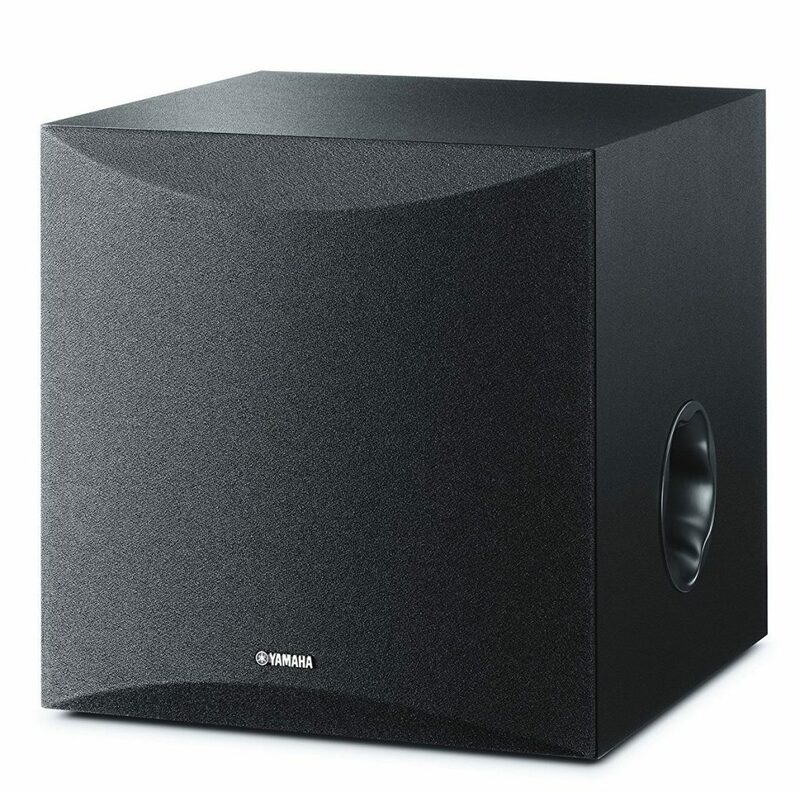 The Yamaha subwoofer has an 8-inch high-quality cone-shaped woofer and a twisted flare port that offers tight and clear bass. It also incorporates advanced Yamaha Active Servo Technology II, discrete amp circuitry and high-performance bass technologies to render an impactful rich bass response. The twisted flare design allows air to flow smoothly around the edge of the port resulting in lessening the noise produced and reproducing accurate, low and clear frequency. The black unit has a size of 11-1/2 x 11-1/2 x 13-3/8 inches. The device is ideal for those who want a stylish subwoofer for their room because of its textured finish. A subwoofer is definitely a great option for people who want to hear clear, realistic and tight bass irrespective of the type of sound. 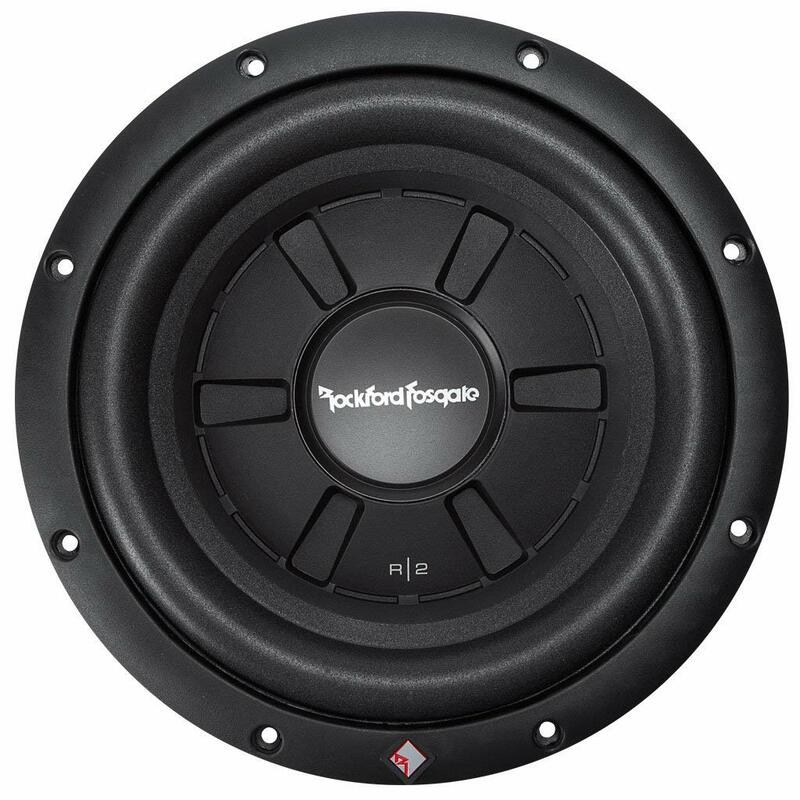 The 10-inch ultra-shallow subwoofer from Rockford Fosgate has two voice coils and comes fitted in a stamp-cast basket with integrated linear spider venting made of 16 AWG tinsel leads. It also features a Class D amplifier and push connectors for wiring. The cone is made of mica-injected polypropylene. The unit can work with a maximum power rating of 400W and has an impedance of two ohms. The subwoofer has a size of 12 x 12 x 5.4 inches and a mounting depth of 3.4 inches. 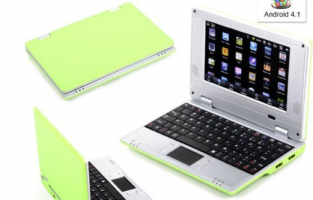 It has a sturdy design while the black color renders an elegant appearance. The subwoofer is ideal for those who are looking to use it with their car audio systems because of the flexibility in wiring. The unit is worth considering if ruggedness is your primary concern. 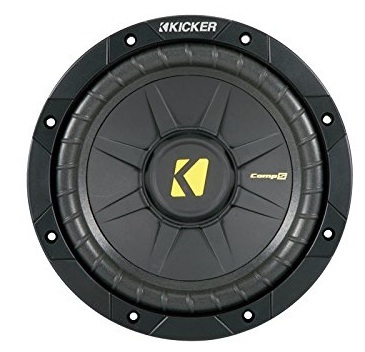 The Kicker car subwoofer comes with an injection-molded lightweight polypropylene cone with a ribbed and tough polyurethane sound. The heavy-duty motor features a large diameter rip-resistant spider vent with high-strength spiral tinsel leads. The 8” diameter unit also encompasses a high-temperature coil wire winding surrounding a vented pole and 1/4-inch heavy-duty spade connections. It also has a 400W maximum power and 200W RMS. The quad venting T slots keep the woofer cool and durable. The subwoofer is highly recommended for those who do not want their unit to produce any form of distortion. The device is ideal for people interested in using the subwoofer in free-air applications and sealed or vented enclosures. The ability of the quad venting T slots to keep the unit durable and cool makes it worth giving the subwoofer a thought if you are apprehensive of it heating up with prolonged use. This front firing powered unit comes with a 12-inch long throw injection molded woofer and a BASH designed amp along with Dolby Digital/DTS and Dolby Pro Logic inputs. The subwoofer also features high-level RCA inputs, gold-plated terminals, a magnetic shielding and a patented Venturi vent that keeps noise at bay. It supports automatic signal sensing, adjustable volume control and adjustable crossover capabilities. The device has a dynamic peak power rating of 475W, an impedance of 8 ohms and a frequency response of 25 to 200 Hz. 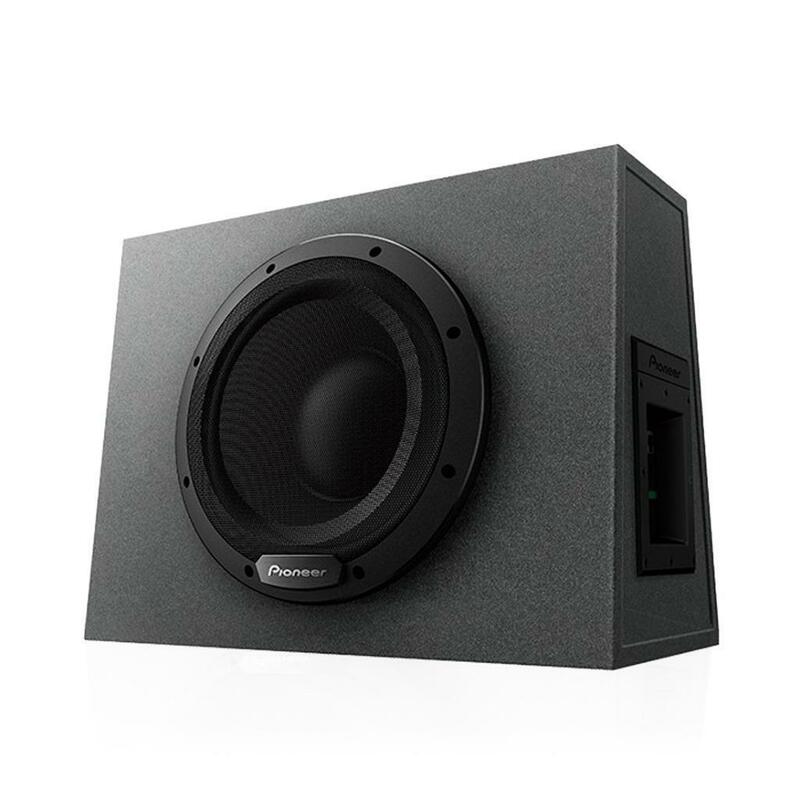 The black subwoofer is almost square shaped and has a size of 21 x 19 x 12 inches. The BIC America system is a great idea for people who want complete noise elimination when watching their favorite movie or listening to music. The subwoofer is a must-have accessory if you are particular about rich, clear and powerful sound rendition. The bass reflex powered Onkyo subwoofer has a 10-inch cone, auto standby/on circuitry, and a phase invert switch and crossover control. The switch allows fine-tuning of the bass output of the unit to match a range of speakers resulting in realistic bass renditions. The auto standby/on circuitry puts the Onkyo unit into standby mode if it is not able to pick up low-level sounds for a considerable period. The black and silver rectangular device features a maximum power rating of 230W, a frequency response of 25 to 200 Hz and a sensitivity of 140 mV/20 k Ohms. It comes in a size of 10-3/16 x 18-5/8 x 16-7/8 inches. The Onkyo subwoofer is best suited for people who are looking for a powered unit that they can use with their 7.1- or 5.1-channel surround system. 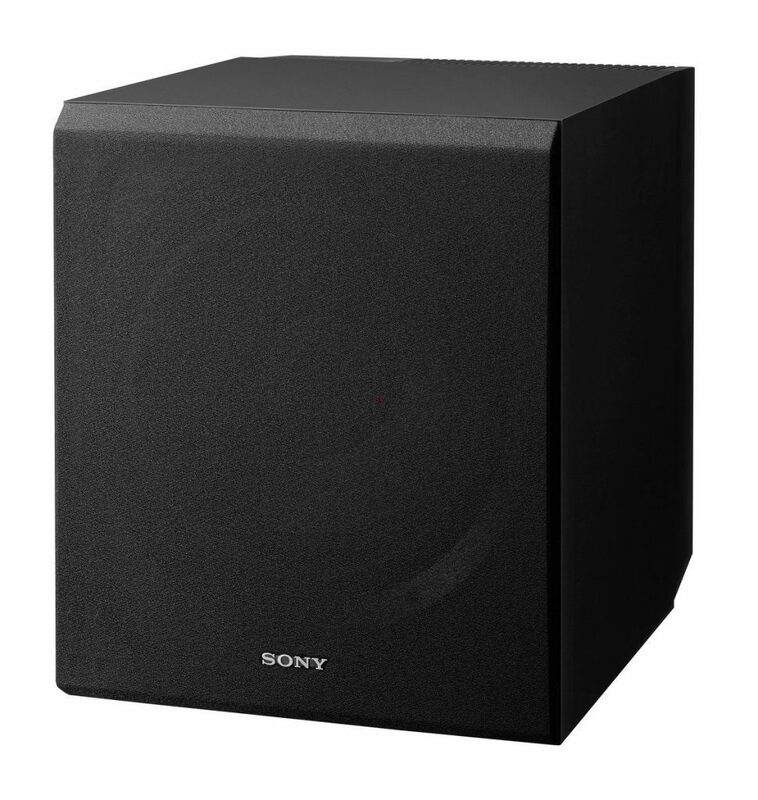 The Sony active amplified subwoofer comprises a 10-inch reinforced and cellular foamed-mica woofer, line level and speaker inputs, a cone diaphragm and a RCA cord. The cone diaphragm produces low-end resonance to enrich the bass experience. The unit comes packed in a wood veneer enclosure that is capable of retaining its shape and has a black finish to match most interiors. It features 115 W power rating, 28 to 200 Hz frequency response and 6 Ohms impedance. The device has a size of 11-5/8 x 13-5/8 x 15-3/4 inches. The Sony system is a great choice for party lovers who want to have some extra merriment with bass-heavy music. The device is ideal if you are looking for a subwoofer that is able to suppress the vibration in its cabinet. The compact unit is worth considering by people who have limited space and yet want powerful sounds from their subwoofer. The slim subwoofer encompasses an 8-inch low frequency, down firing and high-efficiency transducer, a high-efficiency digital drive amplifier, crossover frequency and volume dials, high-level and RCA L/R inputs and output spring terminals. The Theater Solutions unit also features gain and variable frequency control knobs, a bottom slotted bass port, a 180 or 0-degree phase switch, an inbuilt auto shut off mechanism, a Y adapter, a 115 AC cord and two 9-inch and 10-inch RCA cables. The auto shut off mechanism switches the device to standby mode and saves power if it does not receive any signal for two minutes. The port allows air to flow smoothly through the cabinet resulting in lessening port noise and turbulence. The system has a 24 dB per octave crossover and 8 Ohms impedance. It comes surrounded by a high-density MDF enclosure that has advanced RFL bass reflex design. 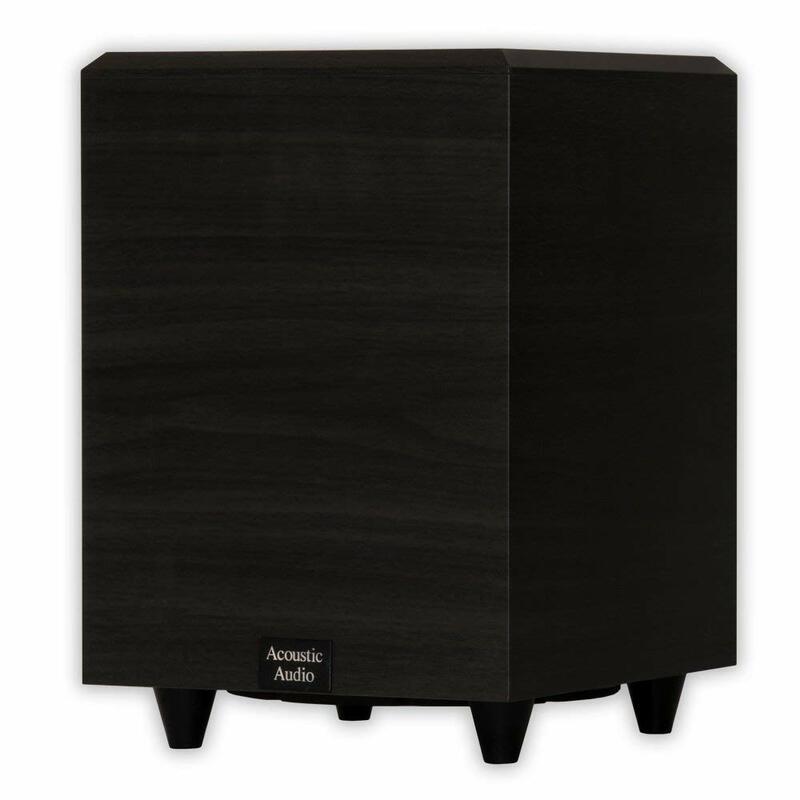 The subwoofer has a size of 4.75 x 24.625 x 15.75 inches and has a mahogany finish that gives it a stylish look. The Y adapter makes the Theater Solutions system a great alternative for those who want to mount the subwoofer on either the wall or the ceiling. The slim structure is worth consideration by people who would like to keep the unit under their furniture. The subwoofer is recommendable for music or movie lovers who wish for powerful extra bass with their home theater experience. The JBL powered subwoofer has a slipstream port that cuts off port noise and renders bass free of distortion at high output levels. The 12-inch polypropylene cone comes enclosed in a die-cast aluminum basket with a 150W power amplifier, line level and speaker inputs and oversized speaker-protection bars and dual-stacked magnets. It has a signal sensing turn-on capability that turns the device on and off automatically when it receives signals from the head unit. The system also encompasses separate controls for adjusting the phase, bass-boost low-pass and input levels apart from a remote control that helps to make drive-time adjustments. The black unit comprises a motor-structure venting that offers thermal protection and a progression spider for maximum mechanical reliability. It has a size of 22-7/16 x 14-1/2 x 12 inches. The flexible connections supported by the subwoofer make it ideal for people who want to connect the unit in various cars at different points of time. The remote control provided makes the unit a good choice for those who want to make bass adjustments without having to stop driving the car. Everything from its real wood finish to the splendid MDF construction which makes the audio quality a lot better by reducing distortion and making it sound more accurate and precise. At 12 inches, the subwoofer is perfectly designed for good audio. 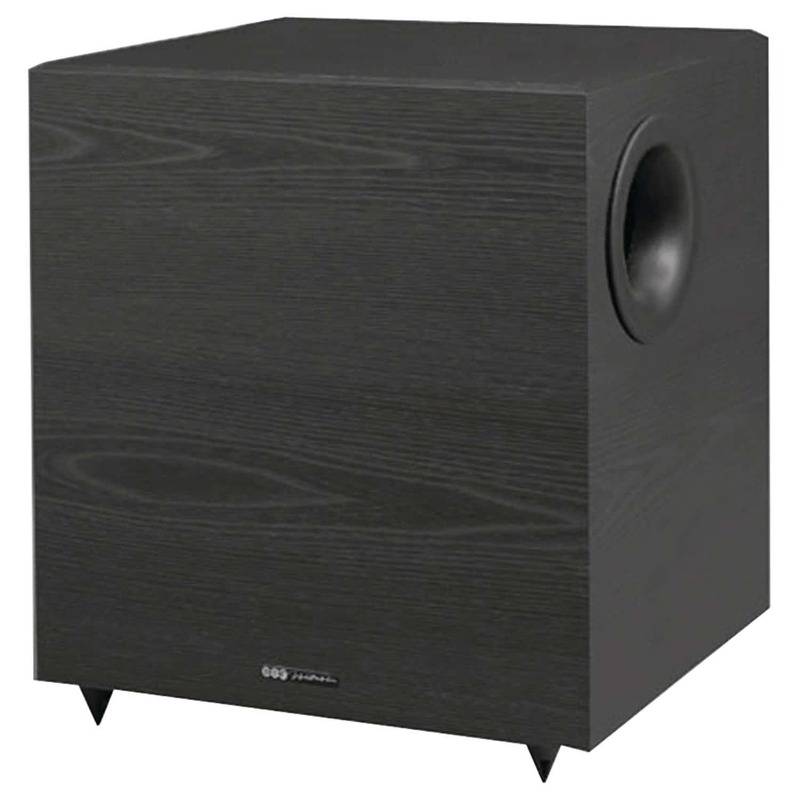 The slot load venting gives the bass produced by this subwoofer a rich sound. It can easily blend with any main speaker so that you can enjoy a great audio experience. 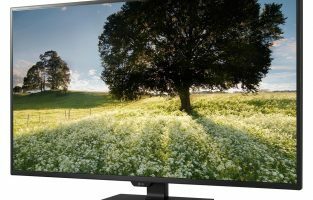 Whether you watch movies or play games, if you need a realistic experience, the PSW505 can do just that for you and that too at an affordable price. This 1150-wattpowered subwoofer is great if you are hoping to enjoy movies and games along with some amazing audio. It has an impedance matching circuit and it includes its own power. This means that the power output to the front speakers will not reduce when you have it connected with your speaker system. 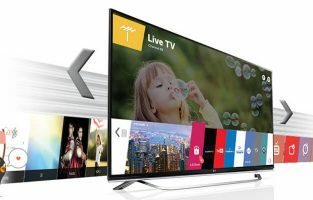 It comes with the option to go into sstandbymode if it does not receive any signal for 2 minutes. Monoprice gives you the option to keep the subwoofer on for as long as you want if you do not want it to go in the standby mode. The workmanship of the v1020 is brilliant. It looks splendid and sounds equally awesome. The polished ash-grey finish along with the bevelled edges gives it a rich look and its sturdy appearance will make you feel that it is definitely going to last long enough. So with design and durability not being a problem, the only other thing left is the audio quality which is very good too. The reproduction of bass is accurate which means that you would not have to worry about the unwanted booming which can take away the true nature of the audio. This 5-inch subwoofer is small but powerful. 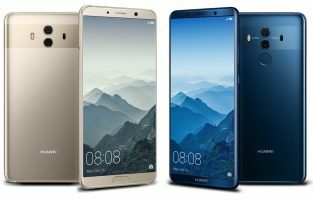 It delivers a quality design and a great audio experience. 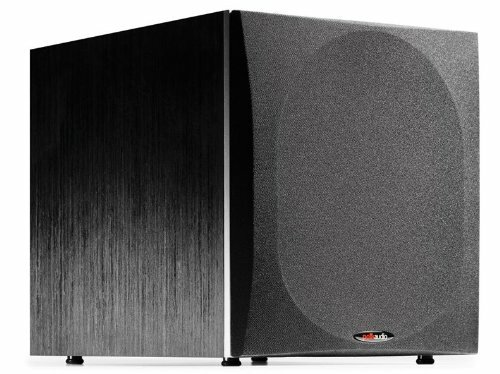 Keeping the size in mind, you may not be able to use it in large rooms and if you are fond of booming bass sounds then this subwoofer may not be suitable. It is great if you like precise reproduction of sounds and if you use it in a small room or if you use it on a computer. It features an adjustable low-pass filter, a full L/R line level input and stand-by mode. It is small which means it can be placed easily without occupying too much room and the quality of music is decent which makes it one of the best inexpensive subwoofer that you can buy. Pioneer makes quality bass so much more affordable with the SW-8MK2. 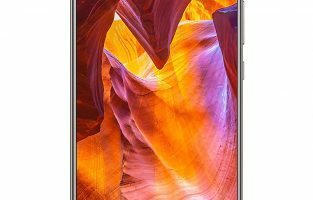 It is powerful, has a great audio quality and uses a minimalistic design. It can give you the option of flexible installation with high as well as low level inputs. The 100 watt amplifier makes sure that you enjoy a rich bass with this 8 inch subwoofer. It features a vented enclosure which helps in adding quality to the bass and giving the sounds a more realistic feeling. If you are hoping to enjoy good quality audio then this is worth the price you would pay for it. This 10-inch powered subwoofer is a classy addition to your audio system. 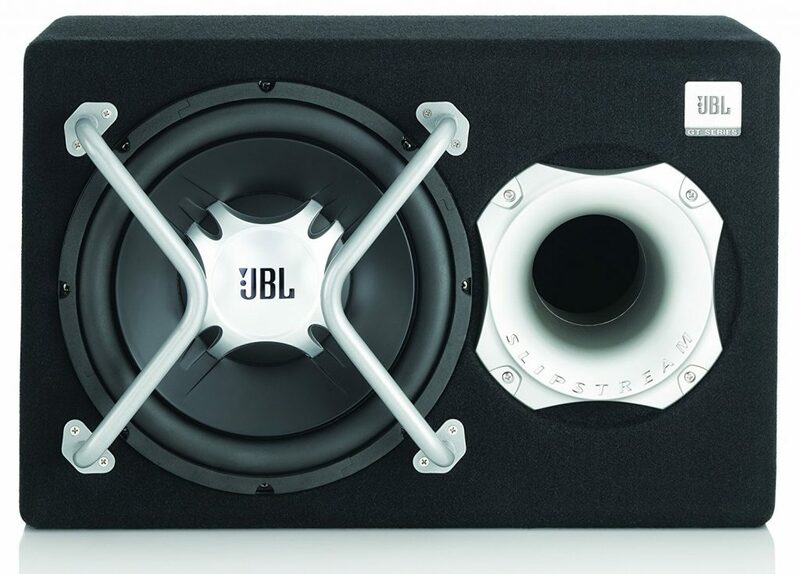 With JBL being synonymous to great quality audio devices, the Sub 100 lives up to its name. It is designed to minimize distortion and reproduce an amazing bass. It seamlessly integrates into your audio system enhancing your audio system and stepping up the audio quality. The power output is adequate for a regular bedroom or a small living area. It may not be adequate if you have a larger room. You may have to invest in a bigger subwoofer for a larger area. 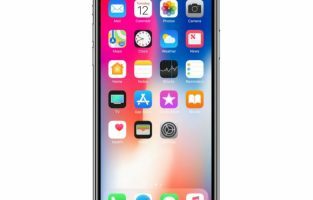 Today, music lovers who want to enjoy more bass for their music or movie buffs enhance the audio quality for the movies that they watch have started relying heavily on subwoofers. Depending on where you want to place these units, you can opt for a floor, wall or ceiling mount subwoofer. Moreover, there are subwoofers meant for use in cars so that you can enjoy your favorite bass effect while on the move. Various manufacturers offer multiple subwoofers in different power ratings to meet varying requirements. Kenwood, Pioneer, Yamaha and Sony are some major players in this regard. The above list is based on different parameters such as mounting style, power rating, size and design style. While most subwoofers are black in color, they may have different textures that change their appearance. However, some manufacturers like Theater Solutions offer subwoofers with enclosures of different colors that give them a distinct look.